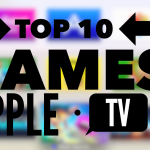 Even as it approaches its fourth anniversary in April, Candy Crush Saga remains a hit among iOS gamers, sitting comfortably as it does on one of the top spots on the App Store’s highest-grossing apps chart. Its first sequel, Candy Crush Soda Saga, has also been a huge success since its release in November 2014, as it’s also a perennial presence on the aforementioned list. 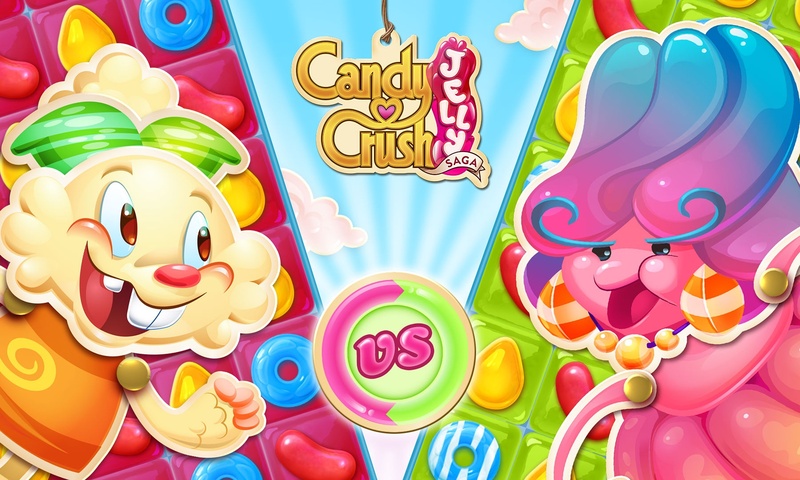 And now, the casual match-three puzzle gaming franchise created by King has another potential moneymaker in the form of Candy Crush Jelly Saga, a new sequel that has just been officially released on iOS but is already at the top of the App Store’s top free apps chart. Like its predecessors, Candy Crush Jelly Saga has you matching three or more candies of the same color to solve a series of puzzles (numbering more than a hundred) across a colorful and cheerful game world. It also lets you connect to Facebook to access leaderboards where you can see who among you and your friends can get the highest score. Basically, if you know how to play Candy Crush Saga or Candy Crush Soda Saga, you already know how to play Candy Crush Jelly Saga. But in Candy Crush Jelly Saga, your main objective is to spread the jelly everywhere before you run out of moves. And to do that, you have to match over a jelly. Another key differentiator is the fact that Candy Crush Jelly Saga incorporates boss battles. 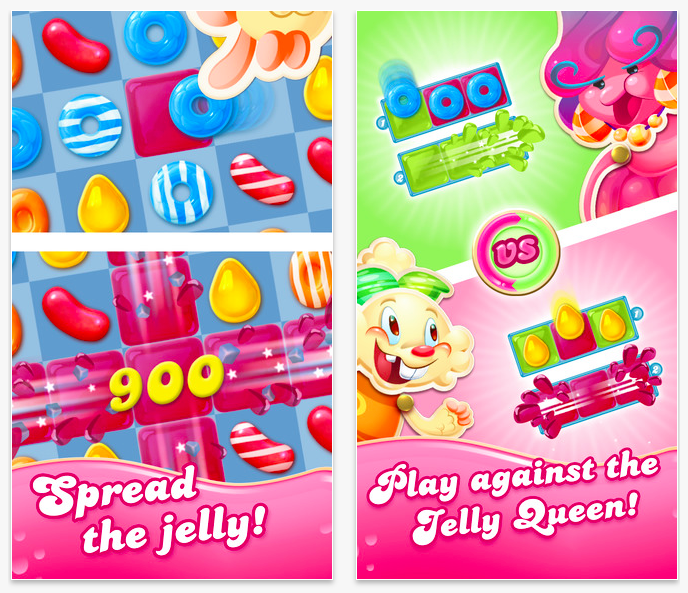 After a certain number of puzzles, you get to compete against the Jelly Queen, taking turns switching candies against her until the jelly has spread all over the board. At the end of a boss battle, whoever spreads the most wins the level. 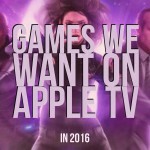 It’s a welcome addition, to be sure, but it would probably be more appealing as a turn-based multiplayer mode where you would be pit against another Candy Crush Jelly Saga player instead of the Jelly Queen. Perhaps a future update to the game would bring about that setup. 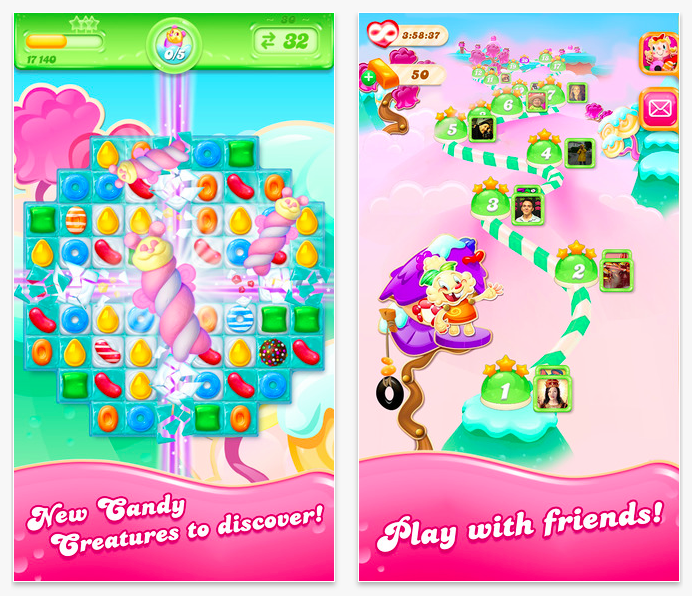 Candy Crush Jelly Saga is available now on the App Store for iPhone, iPod touch, and iPad. Of course, it’s a freemium game with in-app purchases offered for buying in-game items such as extra moves and lives. See also: Booyakasha! Teenage Mutant Ninja Turtles tap into some Portal Power, Gameloft’s Dungeon Hunter 5 now lets you play with your allies in live co-op mode, and Action-packed Jetpack Fighter bursts onto the App Store.